Welcome to IAALP's new website. Become a member and join us for thought provoking dialogues about the future of learning, share your ideas, materials and learning with others in the community. It will be a place you'll want to visit often because the more you contribute, the more everyone will find here to enrich their learning and development practice! Our vision is for IAALP to support Accelerated Learning practitioners around the world - anyone who has done from a two day AL program to the complete certification. That is why the website includes a forum for sharing ideas and learning together, telephone conferences, blogs, information on conferences and interesting programs, and an internationally recognized certification process that is overseen and supported by the IAALP Certification Committee. If you are new to Accelerated Learning, you will find information on our public pages about this powerful methodology that helps you design and facilitate learning programs that have real impact in people's lives. Not only is the learning easily applied and sustained over time, but each person develops their learning agility! Check our calendar to find Accelerated Learning programs where you can experience the power of the method for yourself! You will experience successful practitioners demonstrating their work and hear about their amazing results. During each session, you will have time to also reflect on what you have experienced and apply those powerful techniques to your own learning programs. The conference will end on Sunday with an interactive and creative session to share ways to help support innovation and pioneer the future of learning! New IAALP Chapter in Malaysia! 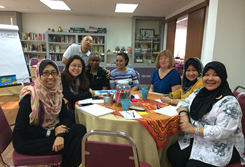 In Kuala Lumpur there is a growing number of Accelerated Learning practitioners. Over 100 people have completed a Starter Certificate, and last year ten people completed their IAALP accredited Practitioner Certification. In June this year, a small group of people met in Taman Tun at the NeoOne Accelerated Learning Center to create a national IAALP chapter. They elected a leadership team, put together a series of one day events to bring practitioners together to share their expertise and learn together in 2014. Contact Murnira Mury, the country representative, for more information (murnira@gmail.com).